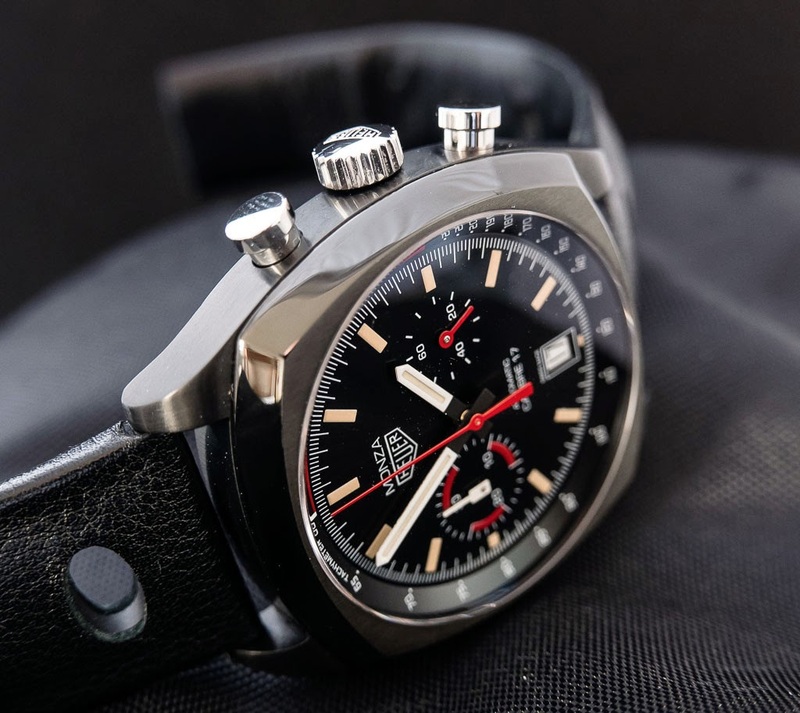 TAG Heuer - In-depth review: Heuer Monza "40 years"
In-depth review: Heuer Monza "40 years"
In 1976, Jack Heuer designed the first „Monza“ chronograph, to celebrate Niki Lauda’s 1975 first world championship won for Ferrari. That watch was all-black and used a round case design with integrated lugs. 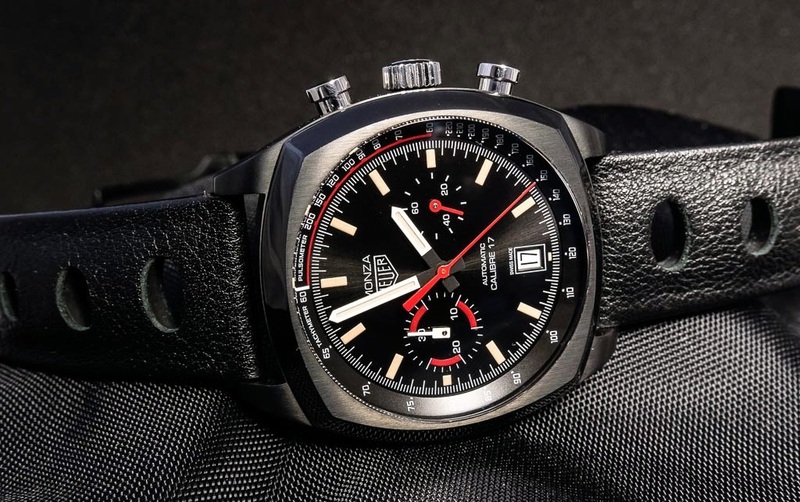 Forty years later, TAG Heuer’s re-edition of this first „Monza“ is different, but quotes the strongest design elements of the original: the all-black case, the combined pulsometer/tachymeter scale on the rehaut, and the high-contrast colour combination of bright white and red with the deep black dial. 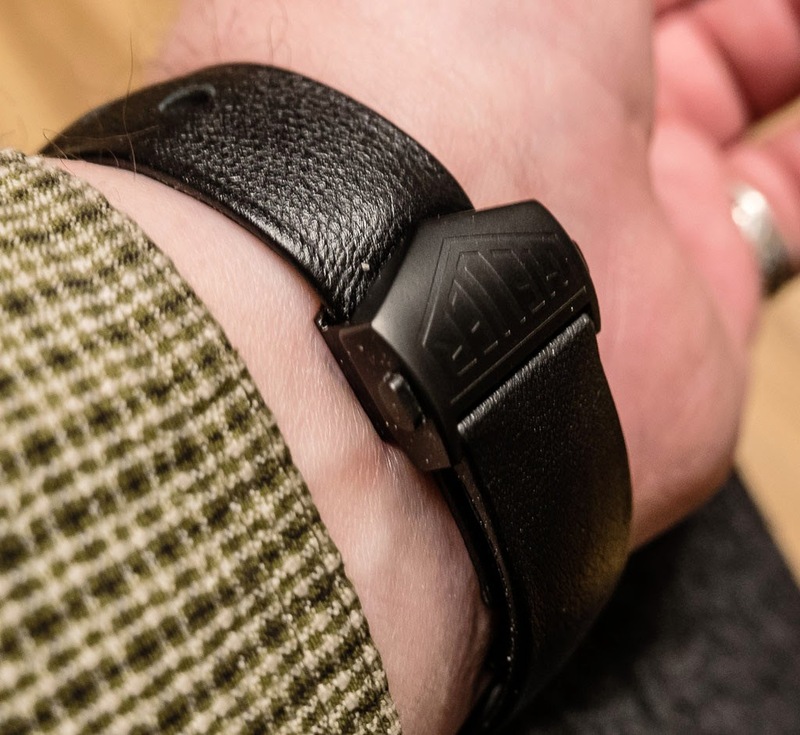 The low weight of the watch (only 96 grams including strap and clasp) and the partially flat, partially shiny black finish leads to the assumption that the case might be made from ceramics. However, it is titanium, PVD coated with a layer of titanium carbide. 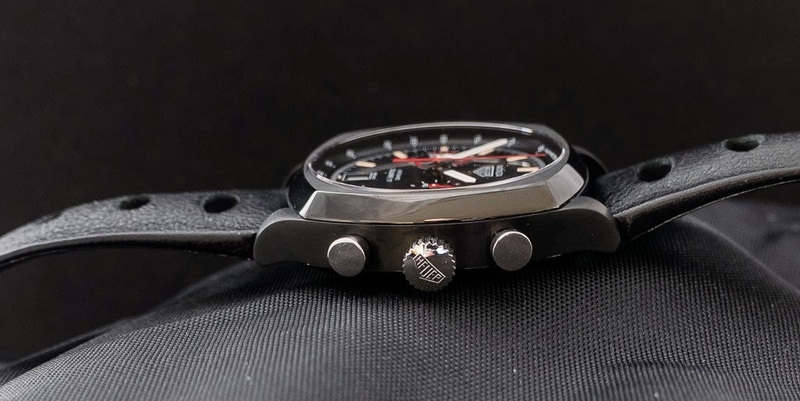 This layer, similar to the more common Diamond-like Carbon (DLC) on steel cases, offers a hardness far superior to that of standard titanium grade 5 used for the Monza case: up to 4,000 HV, compared to 350 HV of the uncoated titanium. While the titanium carbide won’t make the case invulnerable, it will nonetheless protect it from most scratches and abrasions. 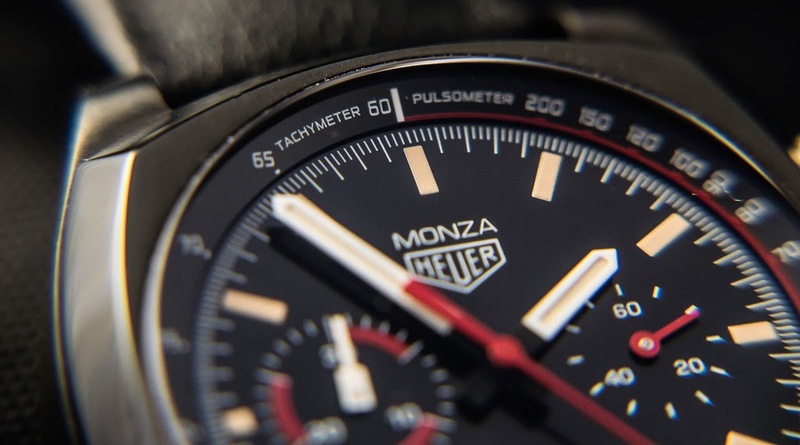 Unlike the original „Monza“ from 1976, this re-edition features a cushion-shaped case, offering nice edges and reflections on the polished bezel. The case diameter (from 9 to 3) is 42mm, diagonally 47mm, and the full length including the lugs is 48.5mm. This might appear large, but compared with the 1976 original 9-to-3-diameter of 39mm, it is an only decent growth. Case height is 13mm, so altogether the proportions leave a harmonious impression. The slightly domed sapphire crystal does not feature an anti-reflective coating. The back has no crystal, but is flat and closed, showing a nice engraving of the old Heuer logo in red, the „Monza“ inscription and the individual watch number. The watch is rated watertight to 100 meters, which is rather surprising, given the non-round case and the unscrewed pushers and crown. The latter are not blackened, but show their natural stainless steel colour, offering a nice contrast with the rest of the casework. The side view also reveals the modular construction of the movement, placing the chronograph pushers on a higher layer than the winding crown of the base. 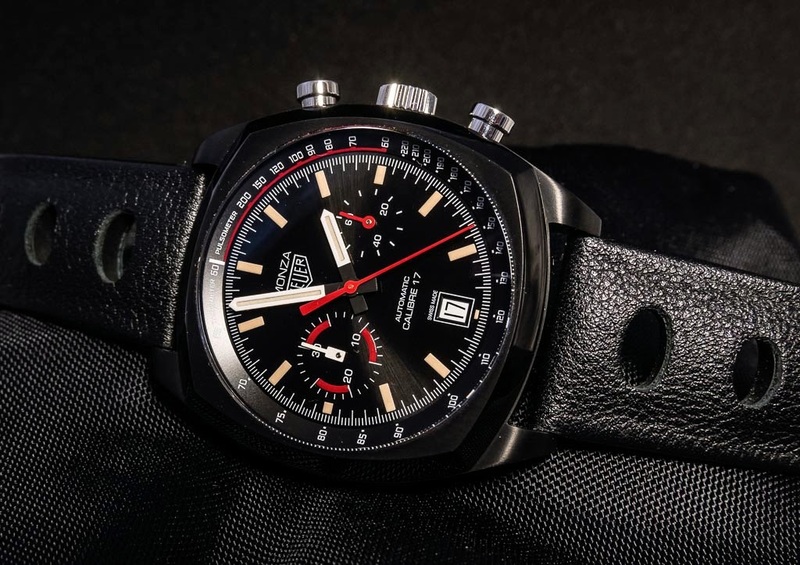 The dial is a pleasant view of a high-contrasting deep black base with bright white hands for hour, minute and minute counter, and bright red hands for chrono and running second. Additional red markings subdivide the minute counter into intervals of five minutes and differ the pulsometer part of the scale on the rehaut from the tachymeter rest. The main hands and hour markers are equipped with the vintage-style „pre-yellowed“ Super Luminova that has become so popular in the last years. The watch would not have looked worse without it, but at least, this colour does not negatively affect the luminous substance’s performance. The date window at 6 does not disturb too much, and is certainly practical. After all, the original edition had a date window at 6 as well. The dial and hands finish is very well, only large magnification reveals a tiny tear of white lacquer on the minute hand, tiny particles and a fibre at the hands’ bearings. I have seen worse in more expensive watches, but also better in cheaper ones. 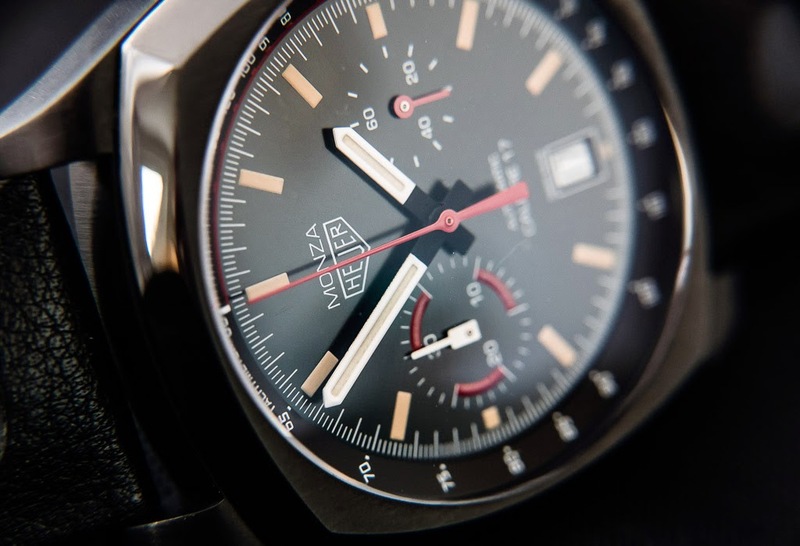 Altogether, the dial offers an excellent legibility under all lighting conditions, including the chronograph functions. 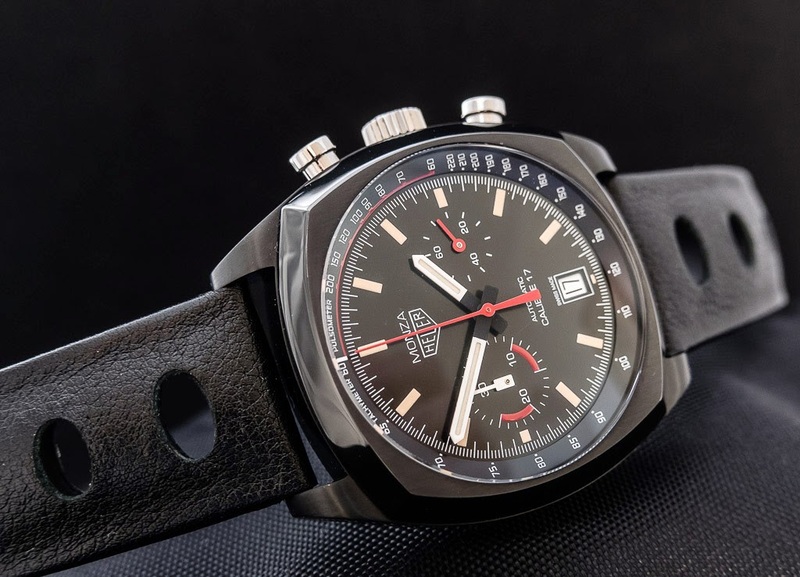 The deletion of the hour counter might reduce the chronograph’s practical value, but the bi-compax layout results in a less crowded expression. 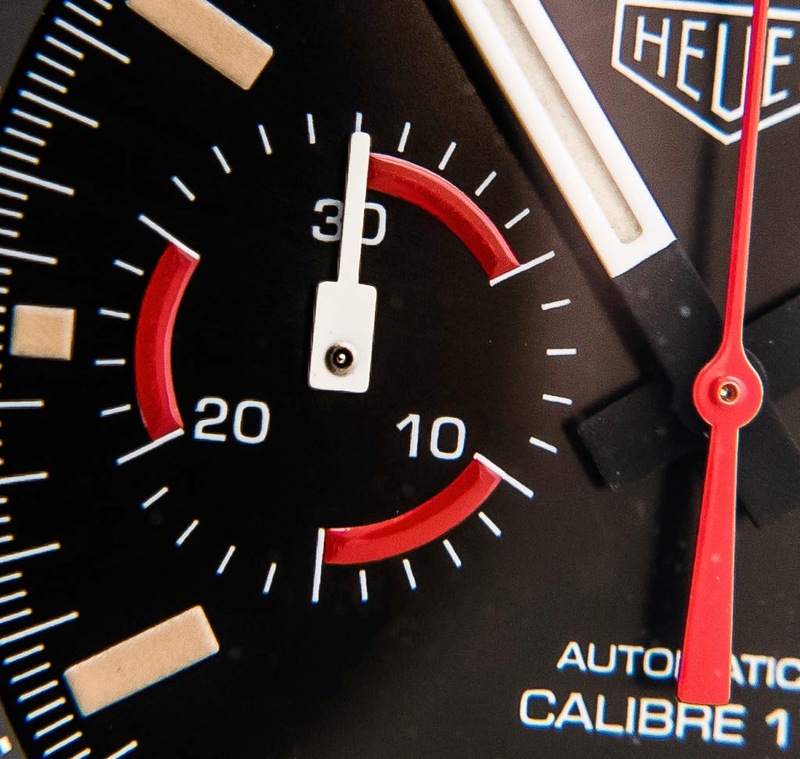 Proudly announced as „Calibre 17“ on the dial, the movement is in fact a modular ETA chronograph, the well-known cal. 2894-2. 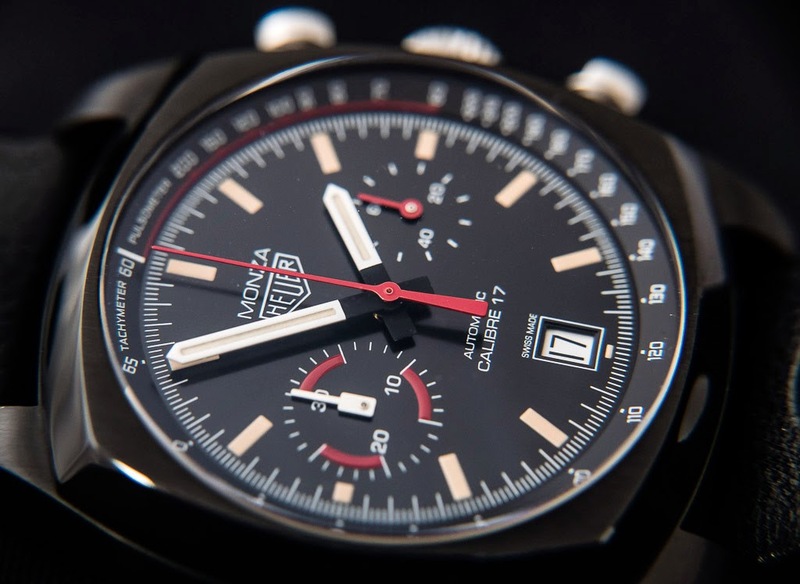 When it was released in 1996, it was the thinnest automatic chronograph movement, despite its modular construction. This construction is even faithful to the original, which was equipped with the well-known cal. 15 module. What distinguishes the ETA 2894 is its unusual layout of the subcounters, with the running second being located at 3 and the smoothly moving minute counter at 9. 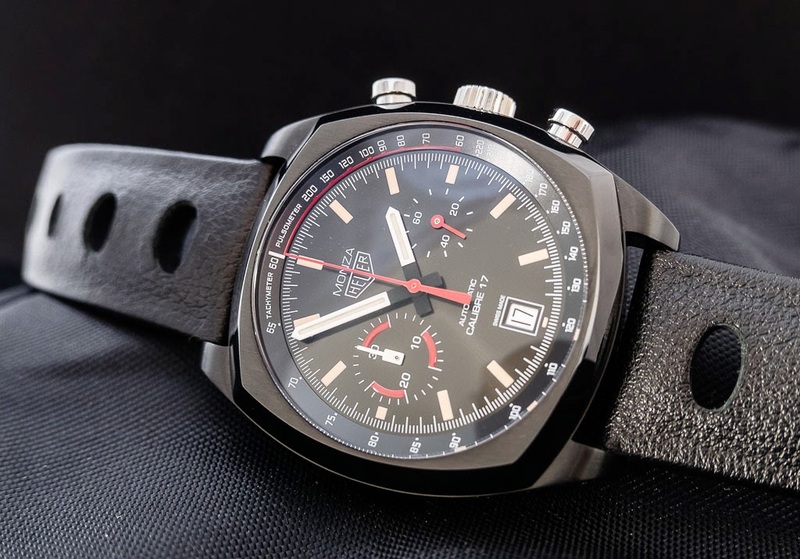 Additionally, it is the only modular chronograph where the date display of the base movement is „looped through“ to the top of the construction, offering a date window without the „tunnel“ so characteristic for other modular systems. Since from the back, only the base movement would be visible, and that is even mostly covered by the huge rotor bearing, it is not a loss that the caseback is solid and does not permit a glimpse on the movement. Pusher operation is firm, typical for the movement, and the chronograph second hand moves with only a slight stutter. Reset is reliable and accurate. 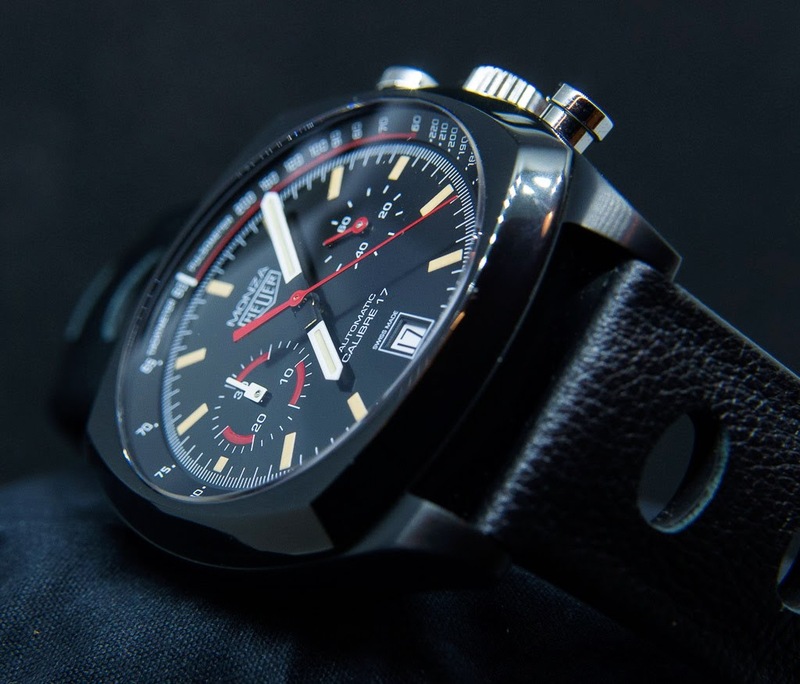 The watch is delivered with a very soft, black calfskin strap, reproducing the vintage rallye-style straps with holes. 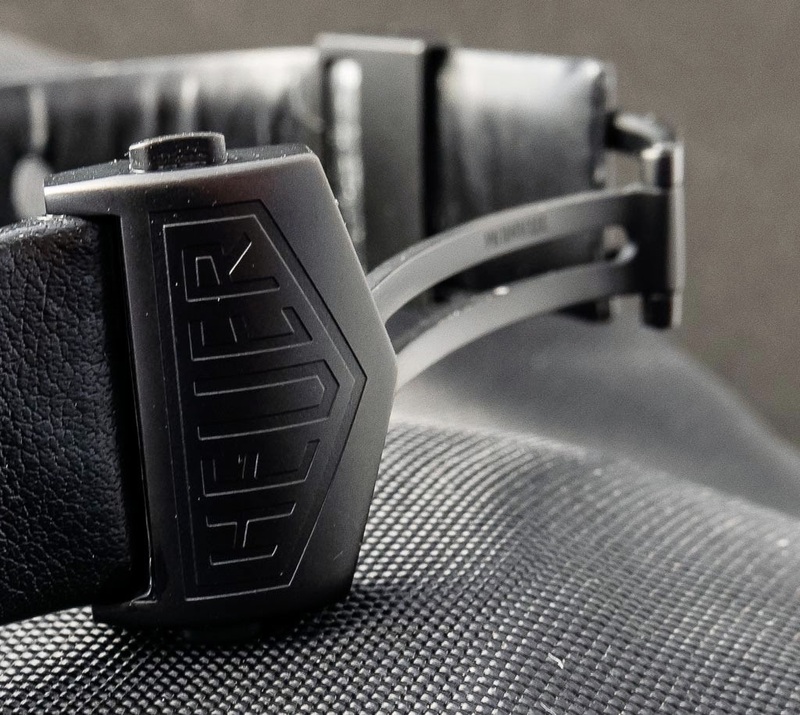 A black folding clasp with the old Heuer logo perfectly complements the strap. The strap has no holes for the clasp to lock into, but is pinched by the clasp, thus permitting a stepless adjustment of the strap length. The downside is that it might be difficult to find OEM straps fitting into the clasp. 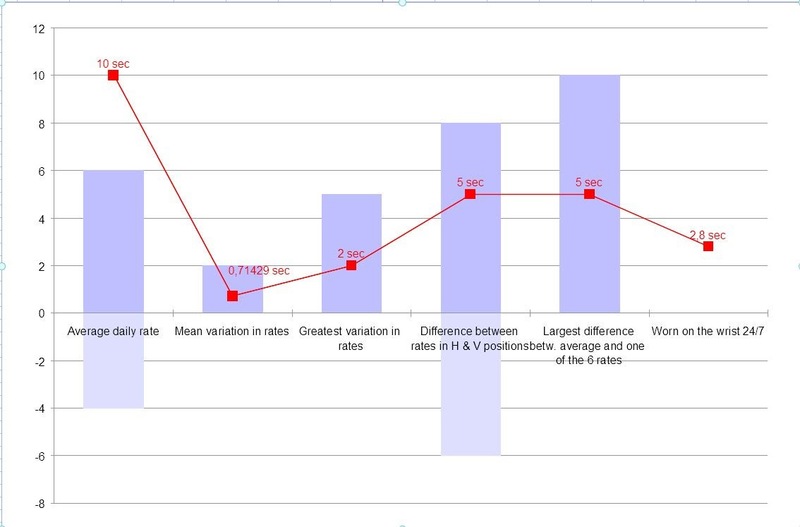 Modern mass production methods also influence the performance of mechanical watch movements: decreasing tolerance margins and fully automated assembly, including at least semi-automated adjustment make it unlikely to encounter a movement with really bad performance. 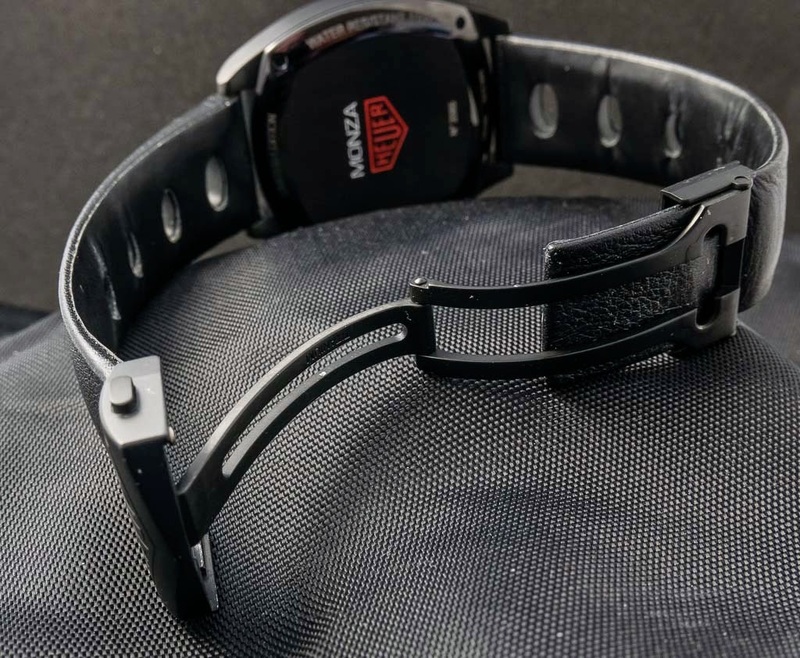 Consequently, most watches I could subject to my accuracy test, regardless of their price, perform within or close to the specifications of the COSC chronometric testing institute. 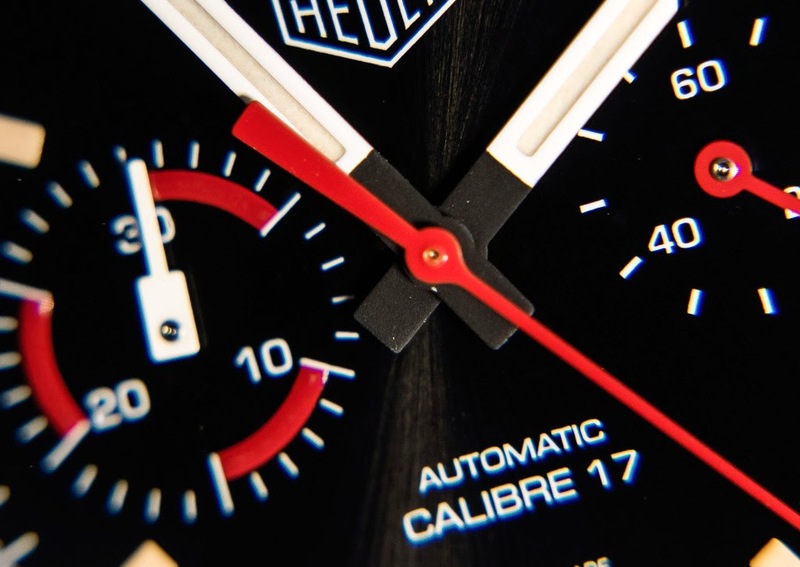 The Heuer Monza is not an exception, as the data show: Its average daily rate in all positions is with +10 seconds per day is outside the COSC limit of +6 seconds, but the consistency of its performance proves that with an additional regulation by a watchmaker, excellent values can be achieved. If this is deemed necessary at all, however, depends on the individual wearing practice. In my case (I wear my watches during night as well) the daily rates on the wrist alter between +2 and +4 seconds, which is in fact very good. With a weight of under 100 grams and its rather decent dimensions, the Monza promises a very high wearing comfort. That this is not the case unrestrictedly is owed to the design of the folding clasp. On its underside, that is resting on the sensitive skin of the wrist’s inner side, the edges are very sharp. Also, the closed clasp is relatively thick with 10mm, so it presses painfully against the skin. 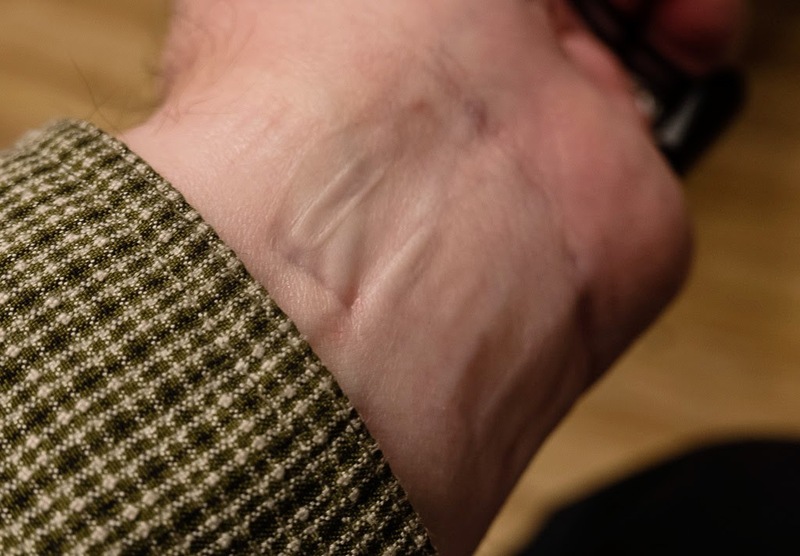 To avoid this, the strap must be worn so loosely that the watch starts to wobble around the wrist; also not very comfortable. My consequence was to replace the original strap and clasp with a rallye-style leather strap and standard tang buckle, supplied by Hirsch. 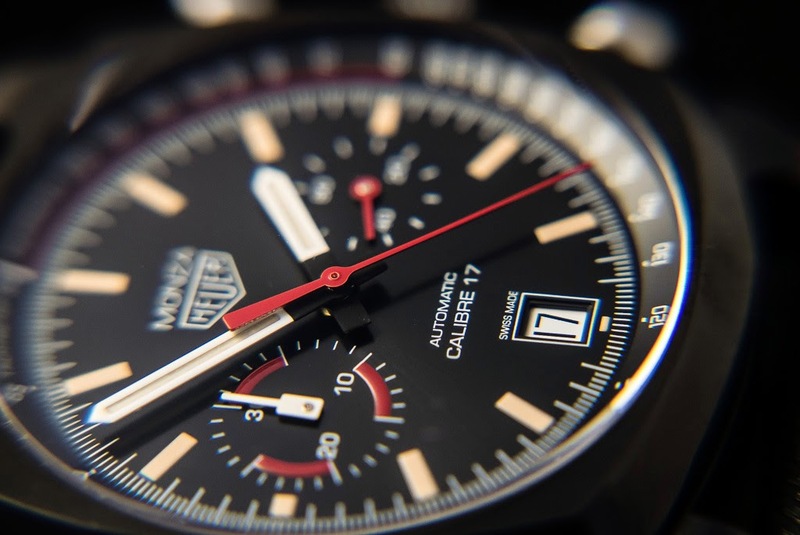 TAG Heuer’s chronographs are certainly not cheap, their price points correlates with ETA-based chronographs from Breitling and similar brands. The quality encountered in this „Monza“ is good, but there is room for improvement: the presence of fibres and particles on the hands should be prevented by more scrutiny in quality control, the accuracy of the movements could be improved by individual adjustment. 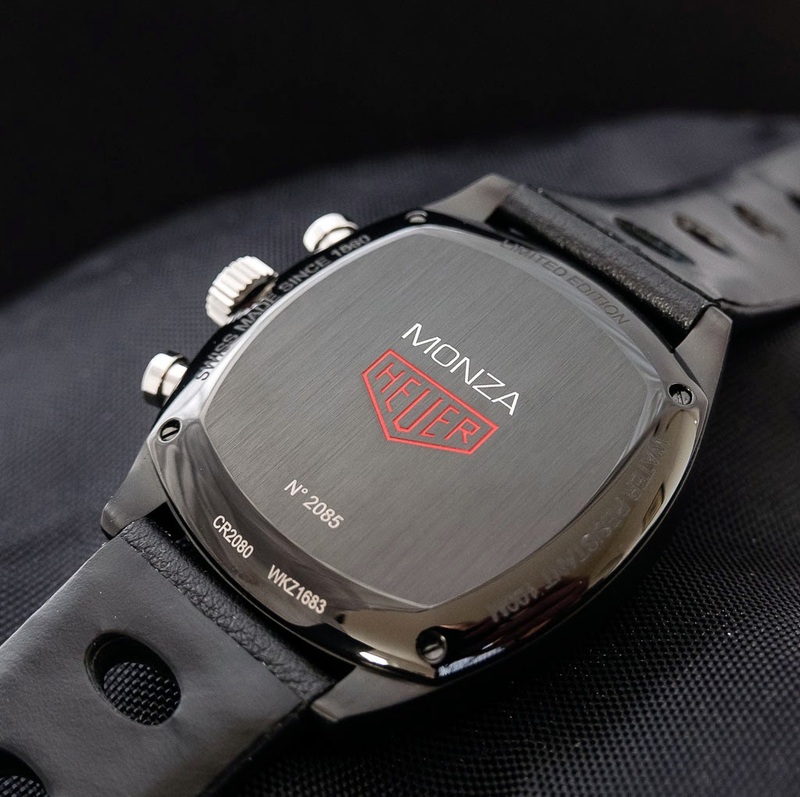 The Monza’s main strengths are its attractive design, the scratch-resistant black finish of its lightweight case, and excellent legibility under all lighting conditions. Thanks for you wonderful review, Marcus!